When you think of food, fresh produce and locally grown fare, by June you’ll instantly connect it with Mackay City Centre. Mackay Regional Council has taken a leap towards positioning our region as a popular food destination by commissioning and funding the development of a weekly farmers’ market. 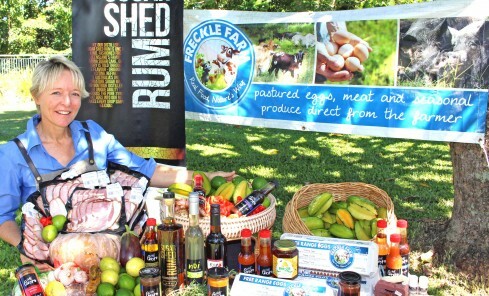 To be held every Wednesday from June 8 at Wood Street Park (beside the heritage-listed Pioneer Shire Council Building), the Greater Whitsunday Farmers Market will showcase a host of locally produced food and beverages. The markets will be hosted by the non-profit group, the Greater Whitsunday Food Network (GWFN), in partnership with the City Centre Taskforce and council. GWFN President Deb McLucas said network representatives would travel from Clermont in the west and Sarina in the south through to Bowen in the north to generate interest from growers between March 7-11. “We really want to personally encourage farmers to be involved in the markets; ultimately we want our city to showcase the best of the best produce we have available right here in our own backyard,” Ms McLucas said. Council’s Economic Development Manager Debra Howe said the weekly market was anticipated to attract a crowd of about 30,000 annually. “When fully developed, this event has the potential to draw close to 80,000 people a year to our City Centre,” she said. “While it’s difficult to measure the economic injection this event will derive, the number of people attending will no doubt provide a significant boost to city businesses and our local farmers and producers. Ms Howe said the farmers market would tie in nicely with the upcoming Mackay City Centre midweek promotion. “This initiative will be a catalyst for future City Centre promotional campaigns, which will strive to enhance visitation – and shopping and dining – in the city,” she said. Anyone wanting to sell their local produce and/or beverages at the markets is encouraged to contact the market administration coordinator Christine Wilson on 0498 717 941. This initiative is proudly supported by Mackay Regional Council through its 2015-2016 budget, which allocated $1.8 million to support events and conferences held from now until 2017 through the Invest Mackay Events Attraction Program and the Invest Mackay Conference Attraction Program. It’s also supported by the greater Mackay Isaac Whitsunday (MIW) region, as reflected in MIW Farm to Plate Strategic Action Plan.